During the 1800’s, British colonizers identified particular conflicts as being “religious,” a description that many now describe as part of the British strategy of Divide and Rule. Scholars have noted examples of British accounts of “religious conflict between Hindus and Muslims” whose details, as the British recorded them, actually undermined such assertions, as participants whom the records identified as Hindus and Muslims participated on both sides of specific conflicts. the resentment of entrenched upper caste Hindus against the ruling parties that “pampered” Muslims and lower caste Hindus, with affirmative action like reservations in government jobs. So, the conflict could perhaps be described as “economic hatred” compounded with “political rivalry”. So, why turn to “religious” designations, even as some of the tensions are between groups commonly identified as Hindus? For some politicians in India, perhaps it is a calculated move to wrap their ideological position in a mantle of “religious tradition” that mobilizes an emotional response to the threat to one’s tradition. Perhaps, the “religious” gives a justification that fighting for economic opportunity does not. Yet, many authors outside India, who may have limited investment in the economic and political outcomes in Uttar Pradesh, continue to reinforce the “religious” label. Beyond generating sensational headlines, the assumption of religious violence in India fits particular contemporary assumptions about the “Other.” Perhaps more significantly, the focus on religious hatred can also neutralize the spectre of global economic inequalities and the benefits that many in America and Europe experience from the perpetuation of that inequality. Perhaps many continue to reproduce the ideas of those greedy, self-interested, cruel colonizers because those ideas also serve contemporary interests. 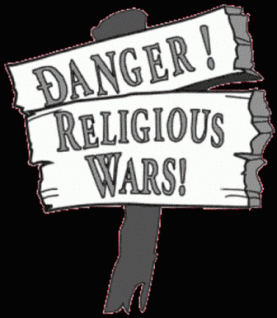 “Religious conflict” seems to me to be an interpretive lens that allows us to reproduce the notion that other aspects of social life (i.e., political, economic, etc.) are rational and structured and modern and understandable and local since we have this way of classifying yet other parts as exotically irrational, unpredictable, traditional, i.e., religious. That the global economic collapse of 2008 made evident that the notion of the free market as a rational, predictable venue is a myth does not seem to have had any effect on those who are still pretty intent on exoticizing “their” conflicts, however. Absolutely, for some it divides the world nicely into rational and irrational. For others, the notion that religion engenders what is of ultimate significance is useful, not because it is irrational but because it provides significant motivation. The category is malleable in many ways.